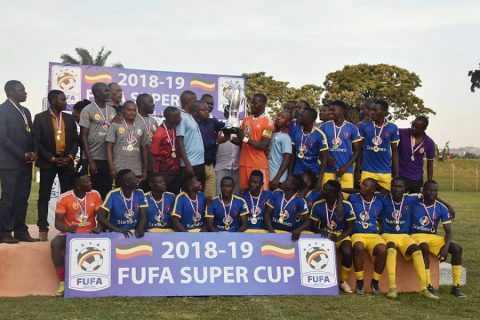 WANKULUKUKU – KCCA FC defeated rivals Vipers SC 4-2 on penalties to retain the FUFA Super Cup on Saturday evening at Wankulukuku. Both sides ended the 90 minutes of normal time deadlocked at 0-0, requiring penalties to be separated. KCCA FC goalkeeper Charles Lukwago was the star of the day making several eye catching saves both in normal times and the shoot-outs. In the first half, Lukwago made a stunning double saves; First denying 2017/18 league top scorer Daniel Sserunkuma, parrying his low effort and then sending Noah Wafula’s rebound out for a corner-kick. Mike Mutebi’s side’s best chance of the first half fell to defender Bernard Muwanga who could not keep down his fierce volleyed shot from inside the area as it went over for a goal kick. In the second half, Lukwago was at it again as he tipped over a Moses Waiswa expertly curled free-kick, out for a corner. With just a few minutes on the clock, the former Proline custodian saved his side again as he denied Sserunkuma from close range. However, there was still time for Allan Okello to try and win it for KCCA at the other end but his effort was fouled by Fabian Mutombora in the Vipers goal. After the final whistle was blown at the end of regulation time, KCCA tried to make a substitution, bringing on Jamal Maliyamungu in place of Charles Lukwago for the penalty shoot-outs but the match day officials turned their request down. The move would later turn out to be a blessing in disguise with Lukwago saving from Aggrey Madoi and Waiswa. Only substitute Tito Okello and Geoffrey Wasswa converted their spots for the Venoms. Hassan Musana, Mustafa Kizza, Bernard Muwanga and Julius Poloto all found the net for KCCA to win 4-2 on penalties. The victory means KCCA FC retain the trophy that won last year after defeating Paidah Black Angels 3-0. This is the perfect build up for Mike Mutebi’s team as they await the start of the 2018/19 League season next week. For Vipers’, their new tactician Javier Martinez Espinosa missed out on a chance to win his maiden silver-ware in Uganda. The StarTimes Uganda Premier League is slatted to start on Friday, 28-09-2018 but surprisingly, fixture have not been drawn yet.